Didn't do bento for the last couple of days, I've been glued to the TV and internet watching every updated news about the earthquake in Mentaway and Mt. Merapi eruption. Calling my family, relatives and friends in Indonesia and thank GOD everyone is okay, they are far far from the affected area. My deepest deepest condolences, my thoughts and prayers are with the family and the victims of Mentaway and Merapi. 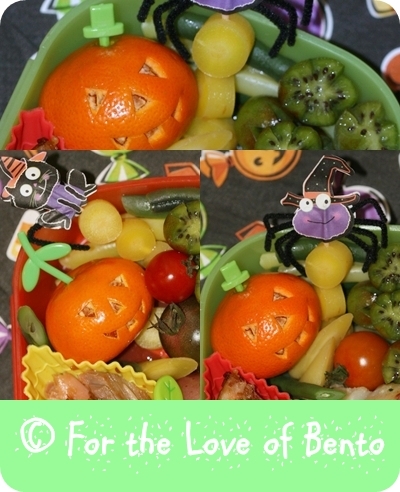 Anyway, I could not think of another spooky bento for the boys, but still want to add a little Halloween things. It's a very simple bentos as always. I cooked some Gemelli pasta served with basil pesto, I hope the boys will like it. And Uh .. I also put some yellow carrots in the mini bamboo skewer I just got the other day. For today's bento, I use the eco lunch box that I just got the other day. I love the separated little container inside but I think I should not use that for today's lunch, why? because it's un-microwaveable and even if I manage to heat up the chicken still the heat will probably spoiled the fruits next to it. So what you see in this picture is not what D is ended up taking. In the morning I took the chicken out to heat it up then put it back in, then I took the fruit and tomato then pack it in another container. Back to the menu, other than sweet and sour chicken is rice o'lantern, steamed broccoli with bones picks sticking out, grape tomato, and purple grapes. And here's the picture of bento for B, I use regular plastic boxes for him, everything is the same but instead of making rice balls, I just layered the rice and topped it with carrot o'lantern and nori bat. I wasn't even plan to make Halloween bento for today's kids lunches, but when I started to put everything inside the box I was thinking maybe I still can give a simple Halloween touches to it, you know like "BOO" letters or something. But still! I wasn't going to take a picture .... too lazy and it was too dark outside, windy and raining almost all day long. Typical northwest weather! Inside the box : beef patty topped with BOO letter from carrots, mini purple potatos topped with "the ghosts" swiss cheese, steamed broccoli, purple grapes and grape tomatoes and strawberry. I also put a cute spider pick. Inspired by yum yum bento book, I prepared the caterpillar bento for the boys, I cooked the rice in some home-made chicken broth then added fresh parsley and cilantro, so it looks greener. I do this a lot coz my boys love it!! Inside the box : leftover roasted chicken, sliced cucumbers, orange bell pepper, carrots, grape tomatoes and checkered apple. Today marks the 1st anniversary of my bento blog, I can't believe I've been bento blogging for a year, I still remember how reluctant I was to get started, I was so worry about my English and this and that, but I am glad I did it!! 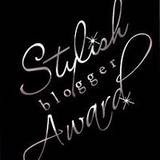 coz I got to know many bento bloggers and get so many ideas, get inspired by them and learn more. Before I did bento blogging I always post my bentos in my Multiply account which I set it up for my contacts only, so it was very limited and seems to be I was the only bento maker there. So this is great. Back to Halloween theme, today I packed the boys some rice served with Indonesian style beef. I have seen some other bento-ers making an eye ball using bread with special edible marker, but I do not have such tools yet. So this is what I did after I prepared some rice balls. I put some ketchup into small plastic bag, then poke a small hole at the edge and then squeezed the ketchup out creating the red marks on the rice balls. Then I put a circle nori cut by scissor. I am not to crazy about the result but the boys seems to be excited to get Halloween bento again. Other than rice balls and Indonesian style beef are some orange bell pepper and yellow carrots. And I also packed them some fruits and snack (not pictured). I really want to make another Halloween bento, but last night I was so blank and couldn't come up anything, I ended up standing in the kitchen doing nothing and wasting time. I think I have to look up for some new ideas and inspirations from another bento-ers. Inside the rectangular box is spinach and cheese ravioli sprinkle with EVOO and Parmesan cheese and herb topped with flowered carrots, yellow baby carrots, orange bell peppers and baby Roma tomatoes. On those 2 little containers are some grapes and strawberry and some gold fish for a snack. Before I started with this post, let me share a good news that really touched my heart. 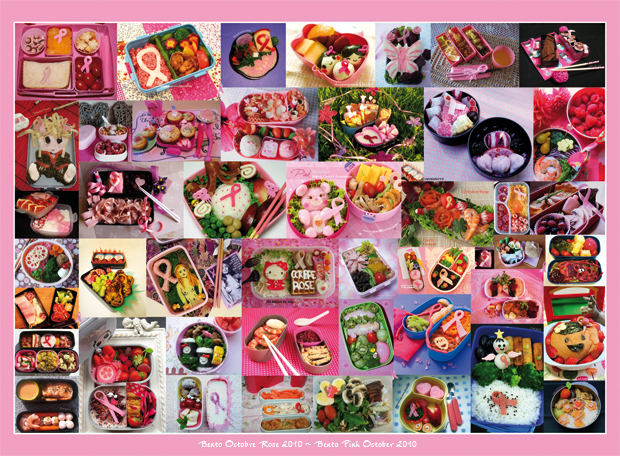 BentoBlog has posted the panorama result of the Octobre Pink Bento Project, 46 bento-ers world wide have participated in the project including me. the panorama is now up for auction on FB. Mine is the green box with the pink egg on the second row from the bottom. But you can also check it HERE. Okay, now to today's bento. I made this supper simple and easy quiche using the recipe from the kawaii bento boxes book that I got a while ago. It came out really nice, I hope the boys gonna love it. I use some spinach, yellow and green bell peppers and smoked turkey, so the quiche is loaded with some veggies and protein. I baked it in the bear silicon without any crust. Inside the box other than quiche are honey sandwich, my plan was to make a tombstone with the RIP letters on top, but the stone shape is not shown as clearly as I wanted, and I was a bit frustrated when I made the letters RIP out of cheese, the letters came out in pieces, so instead I just took the letters out and cut the cheese as it is. Not too bad! The rests are sliced cucumbers, purple grapes and strawberries. All and all the bento is not looking as scary as I wanted to be, but the boys still love it. I am using my new stainless steel boxes that I just got last week and the lids are pretty high, so I can tucked everything and close it with no problemo!!. Love these boxes from Lunchbots!!! 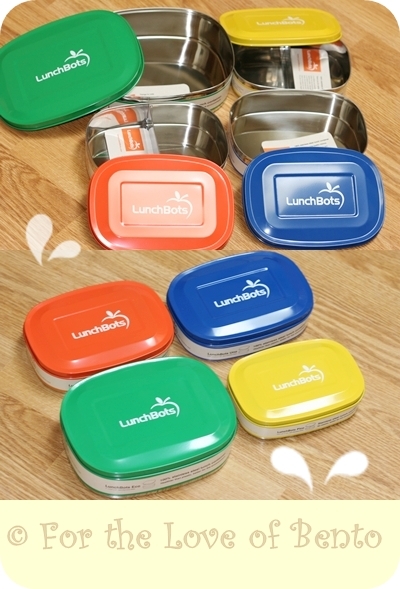 Have no bento to post, but too excited about these new boxes I got from lunchbots, I thought the lids are made out of plastic because it's so colorful, but I was wrong! everything is stainless steel ... sooww kewl!!!! As I mentioned HERE that today I am cooking some Indonesian chicken soup (Soto Ayam) for D&B's school for the Soupy Friday. So I cook the same amount of soup as I normally made in the morning then dropped it at the school around 12:15PM. I told the teacher I could not stay there too long coz baby G needs a nap so badly, so I left school then heading home. Went there again to pick the boys up at 3:30PM and D&B's teachers said that I have to cook more next time. Everybody loves the soup!!! some of them wanted to have the second bowl but they could not! the soup is all gone!! Anyway, there will be so many soupy Fridays to come, next time I'll make sure I make more. I am an amateur bento-er, so most of the time I preparing things at night, that way I can enjoy myself and have FUN doing it. I sometimes try to prepare bentos in the morning but all I can do is only make a very simple sandwich, I have to work my speed up. And still I don't like to do bento in the morning since I have to get the boys ready for school plus still taking care of one and a half baby boy who is very active. Nasi uduk/Indonesian fragrant rice, its a jasmine rice cooked in coconut milk with some Indonesian bay leaf, lemon-grass and some other spices. I shaped the rice by hand and wrapped it with white egg sheet (I omit the yolk). On the next box I pack sliced of cucumber, peeled tangerine, yellow and green beans, mixed baby tomatoes, yellow carrots and kiwi berries. This below picture is bento for D, he said he wants mummy's buddy to be scarier, I tried to make Frankenstein, but failed, I could not come up with a good idea for his ears .... but D still like it and he said it looks scarier. Tomorrow I am not sure weather I can pack them another Halloween bento or just simple sandwich, I have to do some preps for Soupy Friday, its a fund raising program at the school where parents can join their kids to enjoy a dollar bowl of Soup. I'll make some soto ayam, it's Indonesian style chicken soup.... yumm!!! Good thing there's always next time when it comes to bento-ing. And I'd still have lots of chance to make another Halloween bento. I copied Sherimiya's Jack O Lantern idea using tangerine. Bought some over the weekend and I have to use it before its all gone!! my boys love tangerine so much. The rest are Salmon teriyaki, rosted red potato with EVOO and fresh parsley, steamed broccoli, green and yellow green bean, mixed baby tomatoes, yellow baby carrots, tangerine and kiwi berries. And uh .. guess what??? remember the purple (almost black) green been that I bought from the farmers market the other day? I blanched it this evening and its color turning green :P ... no point to buy some more next time, unless if you want to serve it raw. Before I start with my Pink bento, I'd love to share this good news that got me all excited over the weekend and it makes me feel so much better right away ^_^. I WON this Awesome wilton giving away from Kelly (Thanks Kelly!! ), she hosts THE CROUCHING MOTHER, HIDDEN TODDLER, you can read details HERE. Okay, now to the bento business, after seeing so many friends posting their pink bentos and see pink here and there, I am proudly join the event of Breast Cancer Awareness hosted by BentoBlog, Please join me with this event, you can read more details HERE. 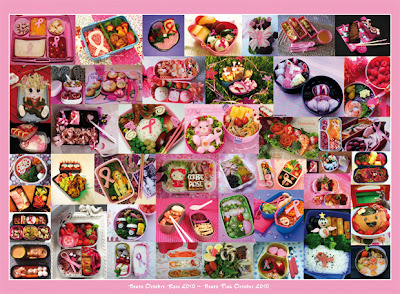 I also dedicated this bento post to a close friend of mine who has survived from breast cancer last year. I made this mini Vietnamese rolls with scramble egg, rice noodle, and lettuce inside, I seasoned the egg so my boys wont need any sauce. I tried to dye the wrapper with some bit's broth but did not come out as pink as I thought it would. Maybe I put a little too much water into the bit. It was kind a disappointing, but it is what it is. My original plan was to serve the rolls with some leftover chicken, but then there would not be any pink on the box, so I changed my mind. I boiled some egg with leftovers bit's broth (Bad choice!!! ), the result is also disappointing, so I decided to put just a view drops of red food coloring, and I think I get some kind a pink that satisfied me. The rest are steamed broccoli, grape tomatoes, green grapes, sugar snaps and kiwi berries. When I get all the foods done, I realized that I do not have any pink boxes, then I checked my food picks collection I could not find the pink note food picks that I have. I must've give it away to a friend of mine who has a girl. But I am glad I still have some other pink color food picks. Back then I thought I'd never make any pink bento since I do not have a daughter. 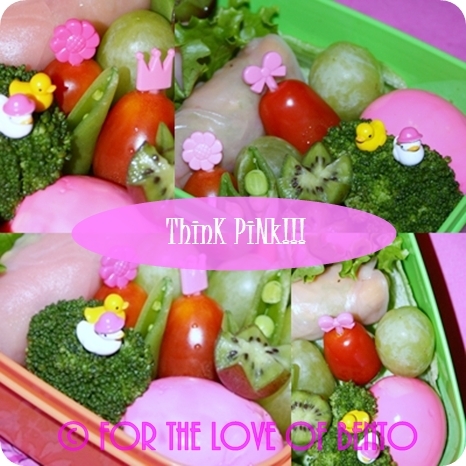 So I am so glad to joint this even coz this probably gonna be the only chance for me to make pink bento. Y'all have a blessings Monday! This is gonna be my last bento for the week since there's no school tomorrow. And I am kind a glad coz I feel like I have to take a break from making bento. Besides I don't feel okay for the last couple of days. Hope by Monday I'd get better and ready to pack some more bentos. For today's bento, I packed the boys some Vietnamese lemon-grass chicken, this is one of my family's favorite dish. Serve with jasmine rice cooked in chicken broth and fresh parsley. My boys love it so much!!! I'll post the recipe in the future. The rest are purple cauliflower, mixed baby tomatoes and asparagus. On the next tier I packed some navel orange and kiwi. This time I am using my new panda and frog bento boxes that I just got from amazon.com. ^_^ The boys are so excited this morning, I can't wait to pick them up. I cook some spinach and cheese ravioli, and the rest are steamed broccoli, asparagus, peeled and sliced oranges and mixed baby tomatoes. I also pack some raisins and gold fish crackers for snack. I use thermal lunch boxes this time to keep the ravioli warm on lunch time. Our weekend was great, the weather was gorgeous here in Bellingham. We went down town on Saturday, had some fresh doughnut for brunch then heading up to the farmers market. I was so excited to found some purple cauliflower, mixed baby tomatoes and some purple(almost black) and yellow green beens. I never seen purple green beans before and I thought it would be perfect for bento this week as I'd love to start giving a little touch of Halloween to it. So I included some leftovers mac and cheese for today's bento along with hardboiled egg, purple cauliflower, mixed tomatoes, asparagus, sugar snaps and I also make turkey sandwich for D and honey sandwich for B. I put that spider witch food picks that I got from Michaels last week. Anyway, up for the boys bento today I prepared some Indonesian savory dish called perkedel kentang, it's a pan fried potato dough mixed with some spring onion, salt and pepper. The boys love it! I also cook some mini beef patty that I froze previously during the week. I normally use it for burgers. I use my new food picks that supposedly looks like a bones sticking out, but it didn't came out as good I thought it would be, maybe I should use meatball next time. The rest are some regular veggies : cherry tomatoes, cucumbers, steamed broccoli, sugar snaps and strawberries. 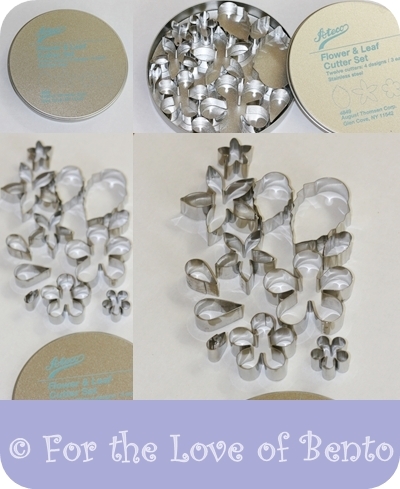 I also packed them some mini pretzels for a snack time (not pictured).